Lightly spiced chicken fillets on mixed leaves, tomato, capsicum, jalapeno ,red onion and feta. Juicy chicken schnitzel with cheese, lettuce and poppy seed dressing on a focaccia roll. Slow cooked beef covered in gravy on a fresh bakery roll served with slaw. BBQ steak with fried onion, mixed leaves, cheese and aioli sauce. Gluten Free wraps available. Baked potato with garlic butter, cheese, coleslaw, fried onion, sour cream topped with chives. All Meals are Takeaway to enjoy in the park. 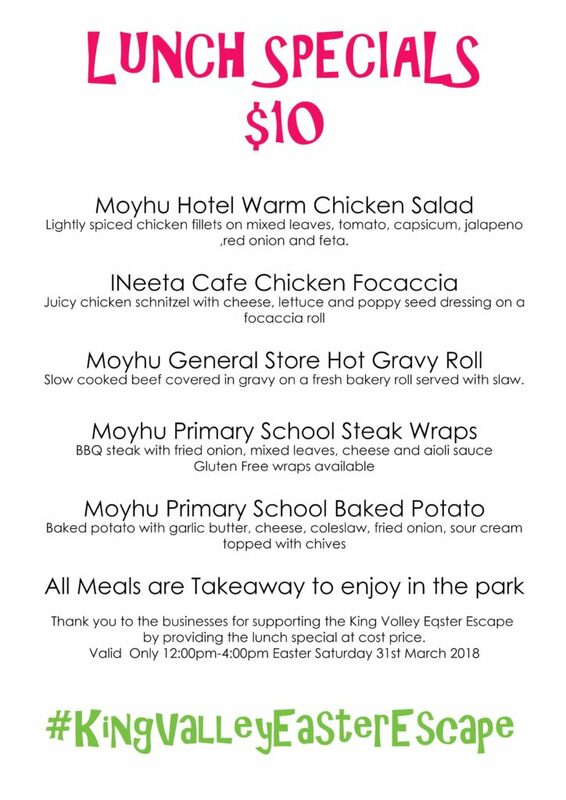 Thank you to the businesses for supporting the King Valley Easter Escape by providing the lunch special at cost price.